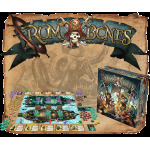 Rum & Bones is a board game of cutthroat swashbuckling pirate battles for 2 to 6 players, 14 years of age and up. 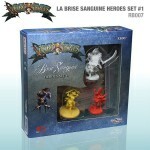 This set is part of the Bone Devils faction. 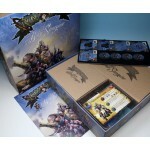 A copy of the Rum & Bones Core Box is required to play. Captain Dracula - The great vampire of legend has led many, many lives through the long millennia, and at many times he's been a sailor. A longtime associate of Captain Albrecht's, he was intrigued to learn of the trubles in the Locker and the appearance of Davy Jones' Treasure in the living world. Since then he has taken up service with the Bone Devils, and often commands his own ship and crew. With persistence and a little luck, he'll pillage enough coin to finally build that mountain retreat he's always wanted. Maybe he'll even settle down; drain a few wives. Who knows? Renfield the Bloodcrazed - Swashbuckler - A longtime disciple of Captain Dracula's, Renfield is quite incurably insane. He's a loyal servant and retainer, however, so Captain Dracula indulges his flights of fancy and lunatic ravings. Most recenly, Renfield has decided he's a vampire. He's been practicing his broodings, drinking blood, and has developed a splendid pallor by avoiding the sun at all costs. Strangest part is: it seems to be working. Still, in battle his ordinary giggling, obsequious self can be seen, as he routinely begs his master for permission to run amok, slicing and maiming anyone unlucky enough to cross his path. Daedalus the Soul-Herald - Quartermaster - Daedalus was once a disciple of the Ferryman himself, and would light the way to the river Styx for lost souls trapped in Limbo. 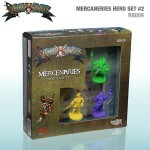 But the Ferryman is a stingy boss, and Captain Albrecht offers far better pay. His lantern still calls to the dead, and the Bone Devils heed just as well as lost Souls. This makes him a natural as Quartermaster. There is one aggrivation taht the living lands have, however: moths. Every-bloody-where. It's a small price to pay though, to sail the seas eternally in search of glory and coin.